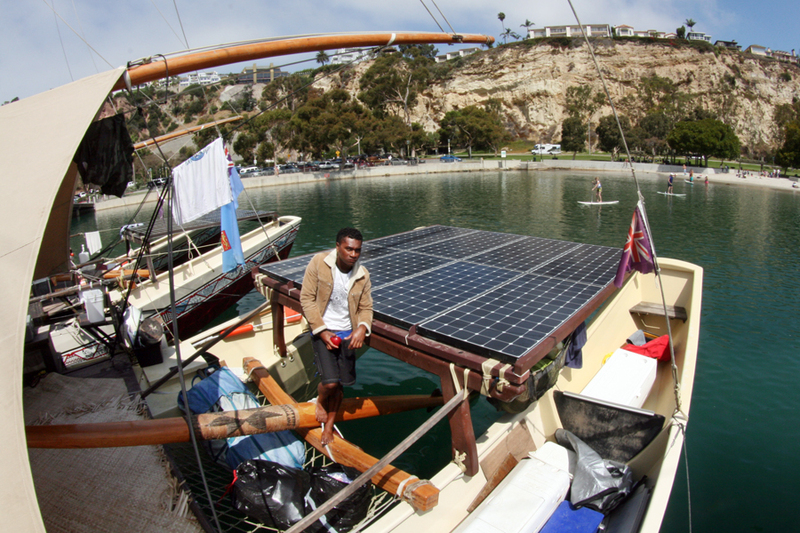 Colin Philip walks around the Hine Moana, at anchor in Dana Point, climbing over railings, ducking under rigging, making sure everything is in place. 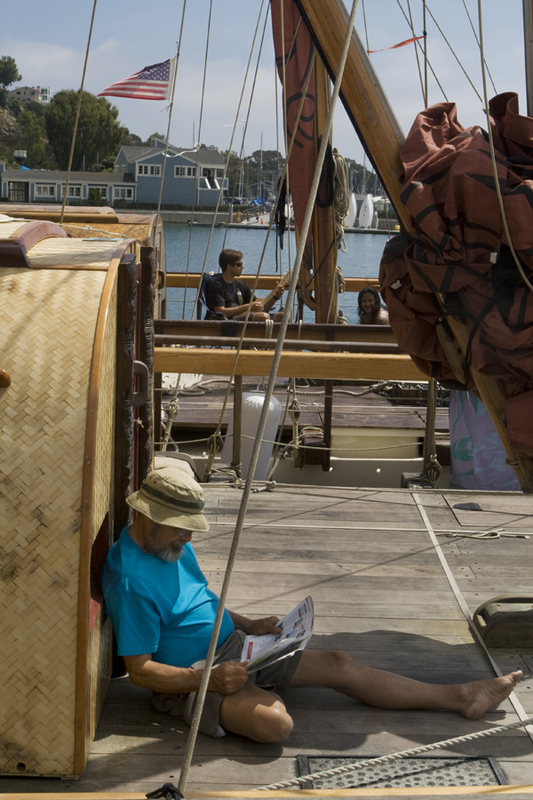 He is voyage coordinator for six vakas, traditional Polynesian sailing canoes, which have sailed from Hawaii to San Francisco and are now on their way down the West Coast to San Diego. The mast broke on his vessel, so he will be towed to San Diego, while the rest of the fleet will sail. They are scheduled to leave in under an hour and tourists are still shuffling on and off the boats, asking questions, taking pictures. Philip is an understated man who doesn’t seem inclined to the spotlight, but knows he needs it. His fleet needs it. The ocean they’ve sailed across needs it. I never received a press release, or any other notification they were coming here. I only knew because of a Facebook post a few fays ago from a friend of mine who happens to be tuned into these kinds of things. There has been almost no fanfare from the ocean-loving beach communities of Southern California, which seems odd when something so unique as a fleet of six ancient sailing vessels come through the harbor entrance down the street. Philip cites a frustrating lack of PR planning, though he and the rest of the crew seem overwhelmingly positive. I offer to use my tools as a journalist to help however I can. The Ocean provides us with the air we breathe, the food we eat, life-sustaining medicines, and nourishment for our souls. Currently, our Ocean is in peril and these essential gifts are quickly disappearing…The Pacific is our home, our breath, our future. We can only survive if we come together as cultures, as crew-mates, to preserve the health of our ocean planet – Our Blue Canoe. 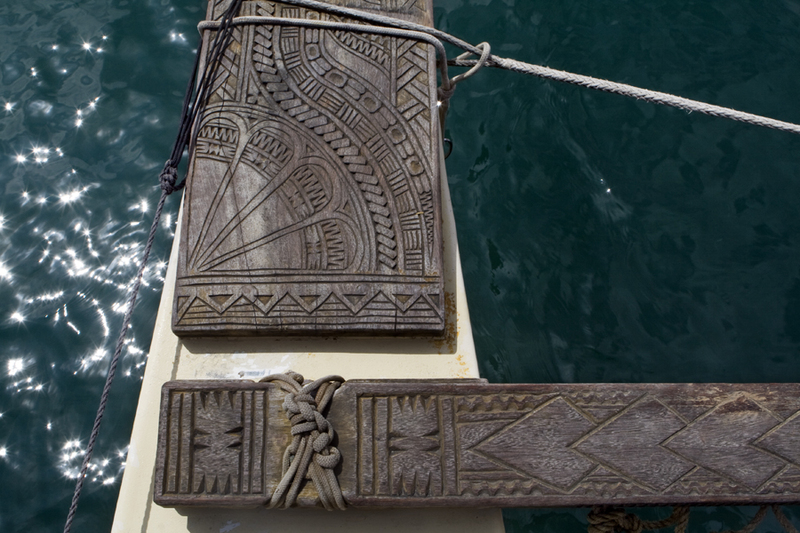 With the Okeanos Foundation, they are launching the “Vaka Motu” project, through which communities on remote Pacific Islands will build their own vakas in a carbon-neutral manner. 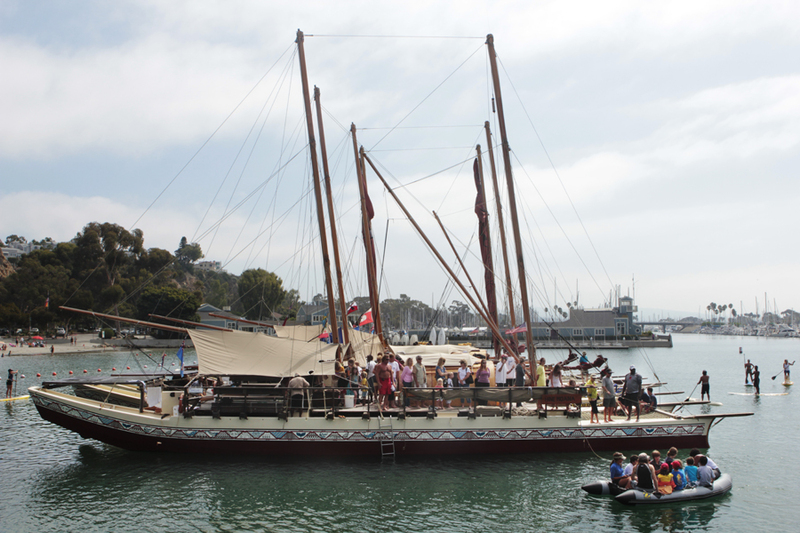 The Vakas have fiberglass hulls, but follow an ancient design and otherwise use traditional materials for the superstructure, sails and rigging. 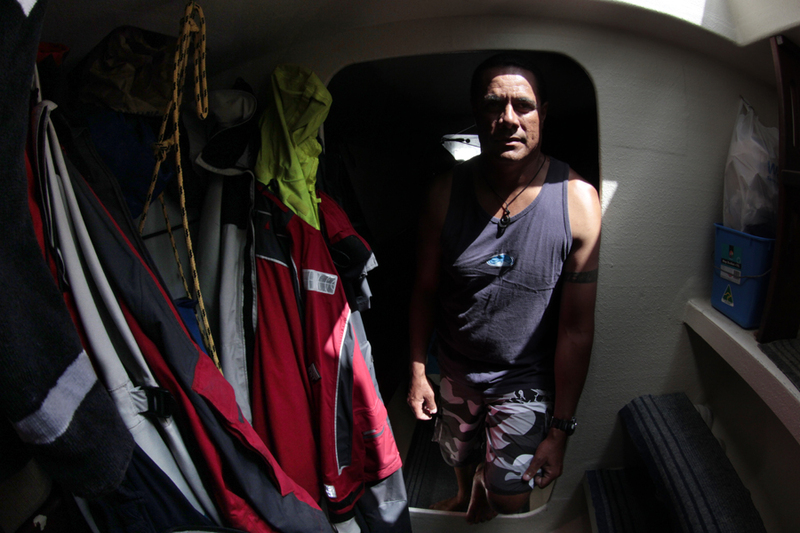 Colin Philip, Voyage Coordinator, below deck. 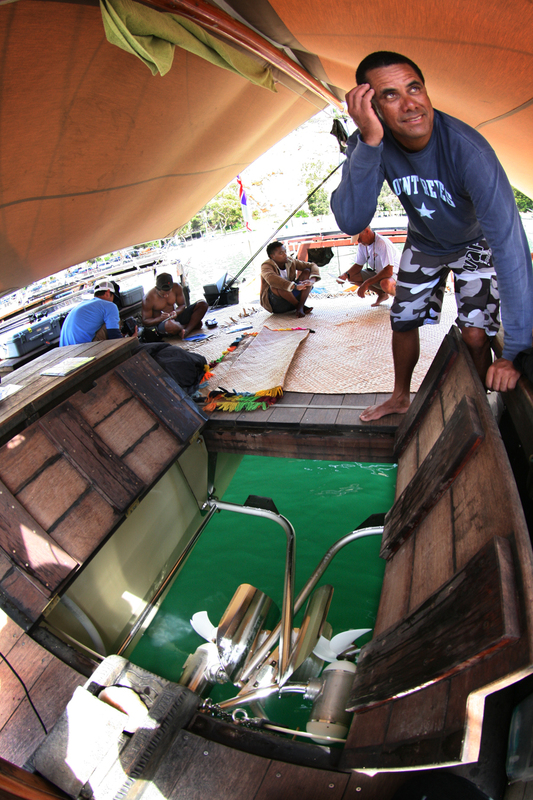 All crew sleep inside the hulls. This would be the other modern addition to the Vaka. Colin showing me the 2 x pod motors that can power the canoe at 6 knots all day, from solar panels, as long as there is plenty of sun. 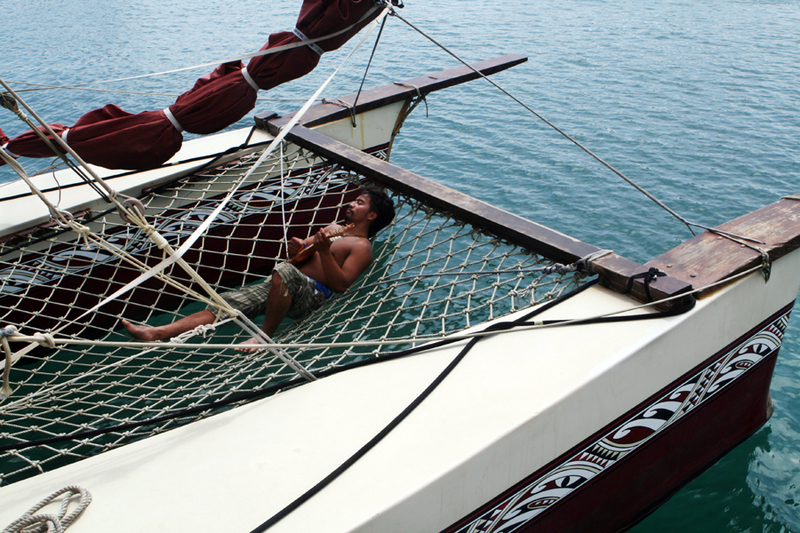 20 year old Fijian Setareki Ledua, the navigator on board one of the canoes. Make that traditional navigator. You know that cliche about navigating by the stars? 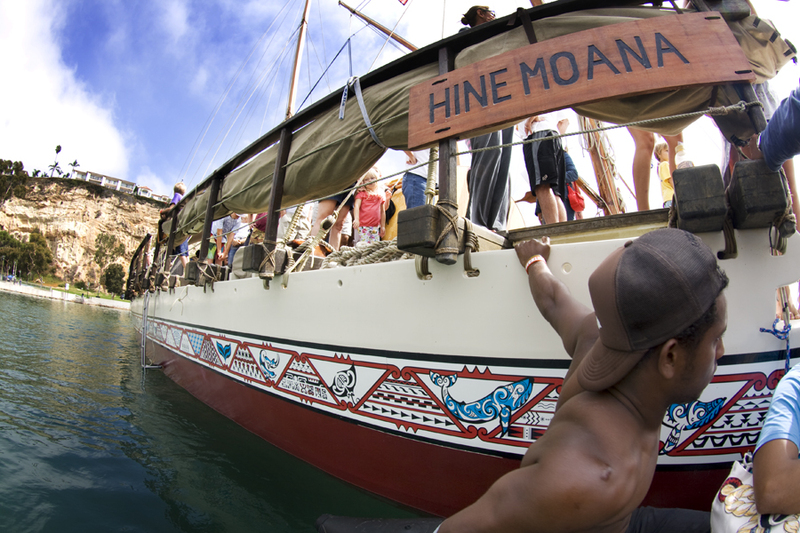 This man does it, and can set sail from Dana Point harbor and safely land you thousands of miles across blue water in Hawaii, Tahiti, where ever. He was wearing his sheepskin jacket all morning — still getting used to the cold climes of Dana Point in August. That 1900W solar array is what powers the motors above. Kalei Velasco, from Kauai, plays the ukelele for Perry Makiha, of New Zealand.